It’s a strong bonding iron-on adhesive and super effective at holding appliques to your fabric surface. You can sew into it and it doesn’t leave a sticky residue on your machine needles. 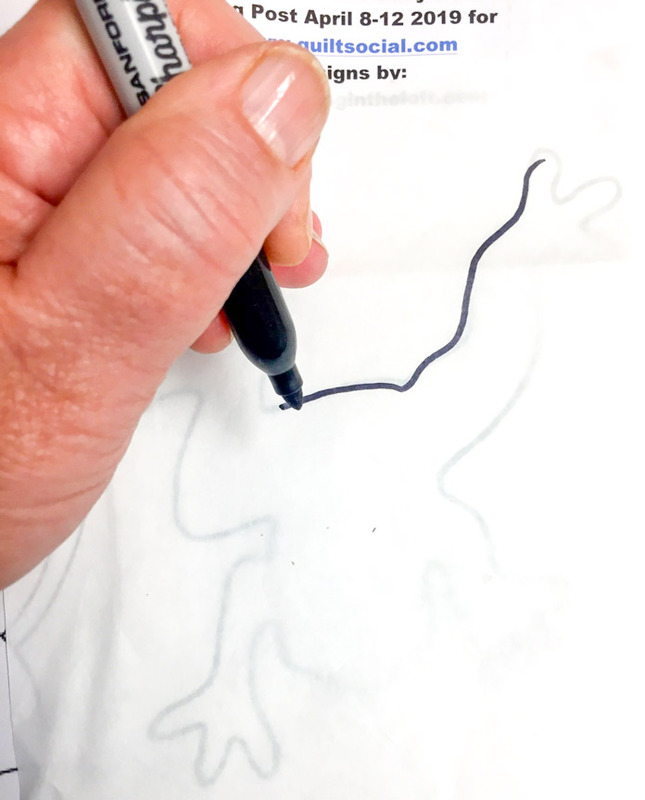 It’s paper backed, so you can draw your appliqué shape right onto the paper backing. Keeps your fabric feeling soft and won’t add extra weight or stiffness to your project. 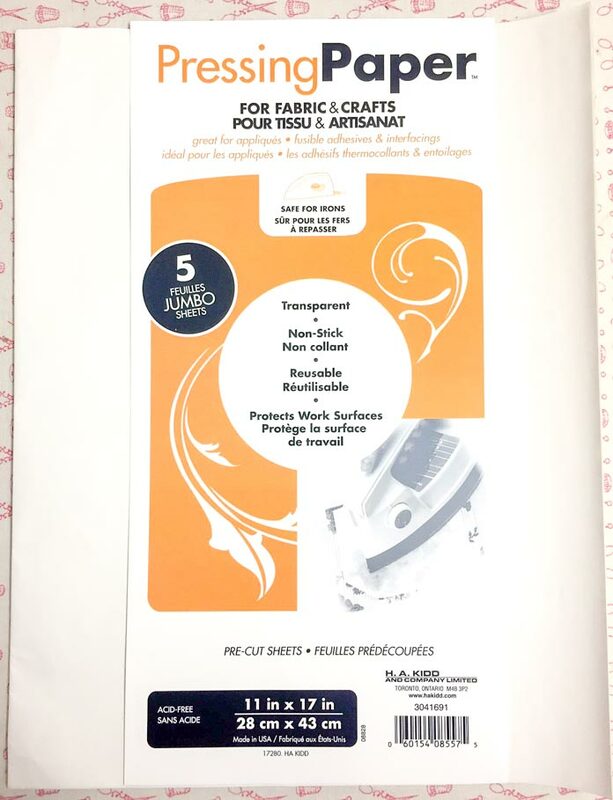 It works great with appliques with many layers, great for quilting, sewing and home decor projects. 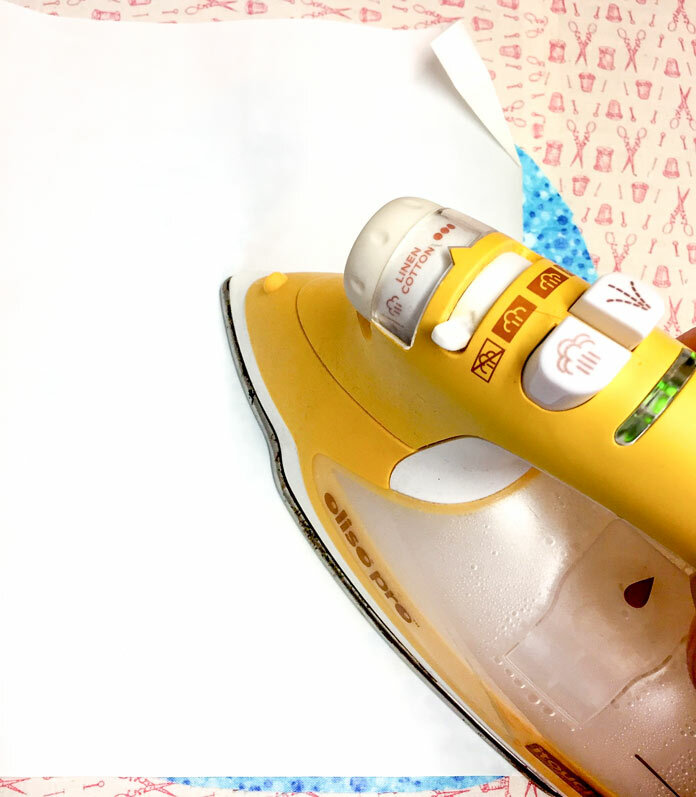 It’s essential when using any fusible product involving your iron that you protect the base of your iron and your ironing surface because if the glue hits a hot surface it will melt and stick. I use Pressing Paper and find this product awesome as it stops any glue residue from making contact with my hot iron and my ironing station. 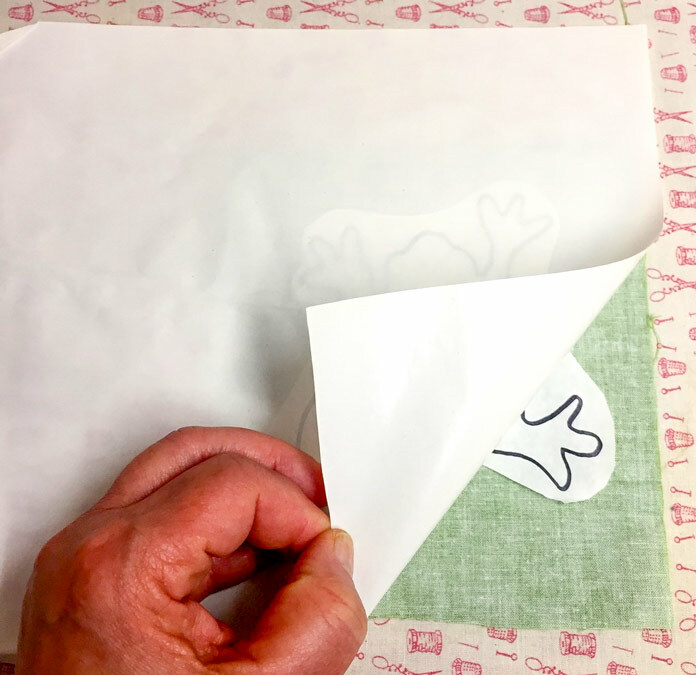 This Pressing Paper is non-stick, transparent (so you can see the design placement through it) and it’s reusable over and over. 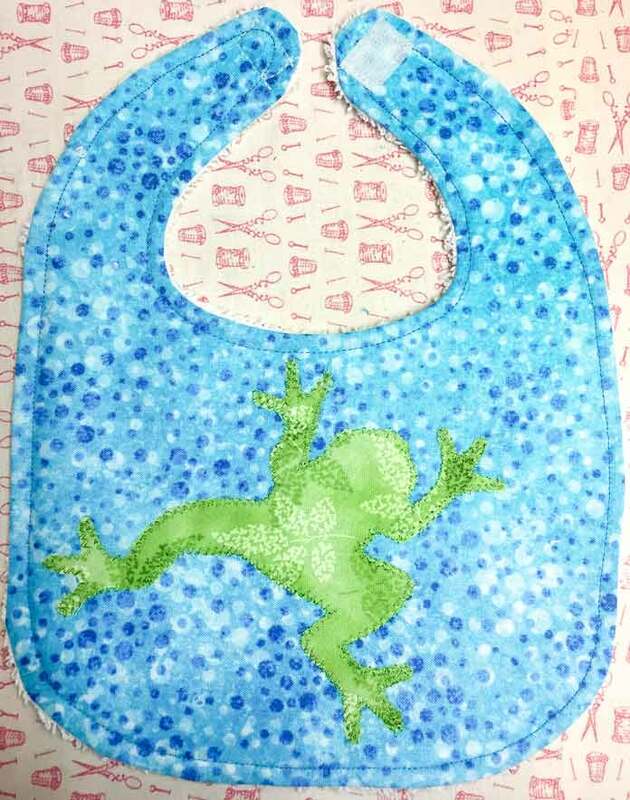 A great project idea to make using HeatnBond Feather Lite and Pressing Paper, is the Classic Baby Bib using fun appliques. This is the ideal applique project for those who have never attempted applique before. It makes a great gift for a baby shower or for the beautiful babies in your life. Baby bibs using HeatnBond Feather Lite and Pressing Paper, fabric from Northcott Stonehenge Kids Undersea 3D. applique foot for your sewing machine. Using the bib pattern provided (photocopy 2 of the pattern), cut out 2 copies with paper scissors and lay one on the fabric and one on backing fabric, pin and cut out with fabric scissors. 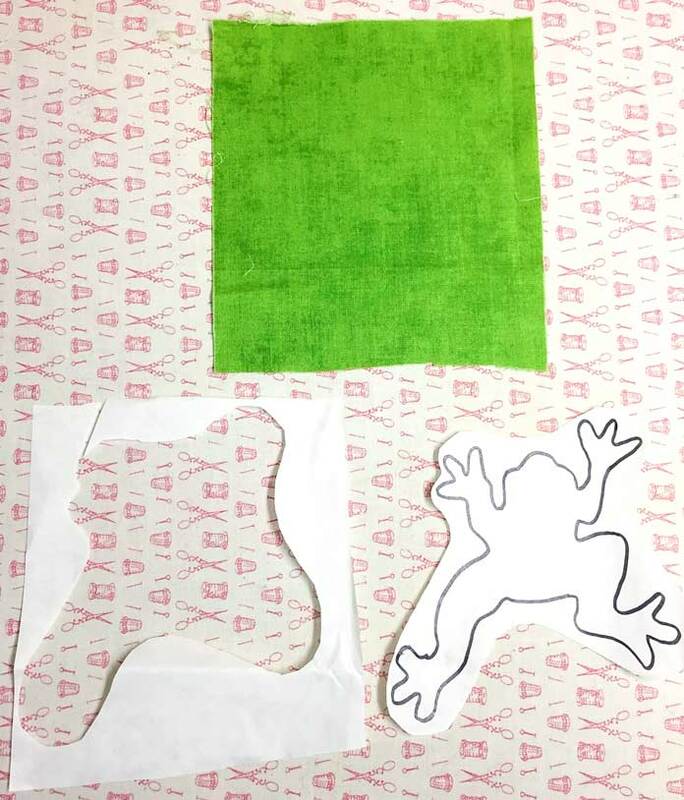 Blue fabric shown is from Northcott Stonehenge Kids Undersea 3D, it looks like water and perfect for the frog applique I have in mind. 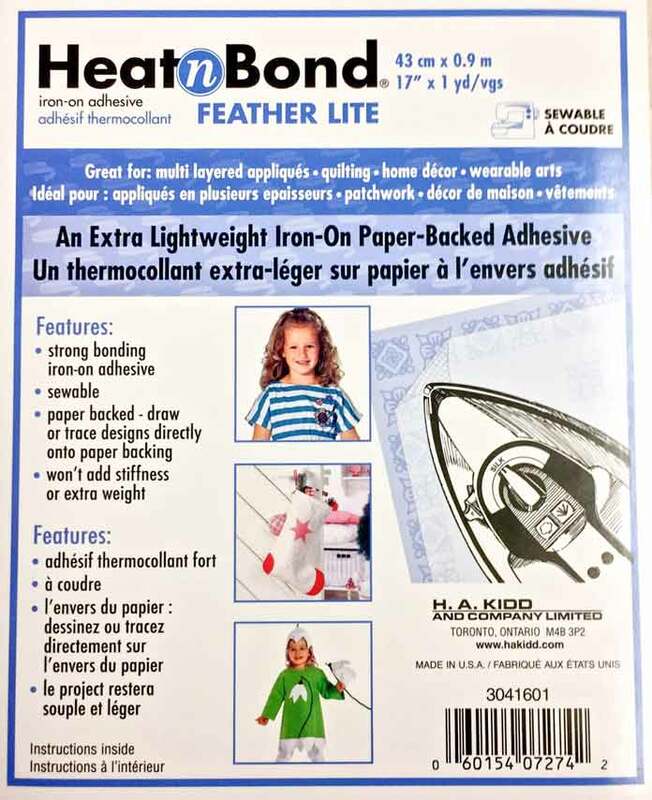 Trace your applique designs onto the paper backing of the HeatnBond Feather Lite using a pencil and the free designs provided or one of your choosing. There are lots of copyright free designs on the internet. Cut out your design roughly and cut out a piece of applique fabric in the same size. Lay the glue side down of the design onto the wrong side of the fabric and place the Pressing Paper shiny side down on top of this. With the iron set to cotton and no steam, press the design holding down for about 10 seconds with a Pressing Paper on top to protect the iron and ironing surface. Applique glue side down to wrong side of fabric. Press for 10 seconds ensuring glue has adhered to fabric. 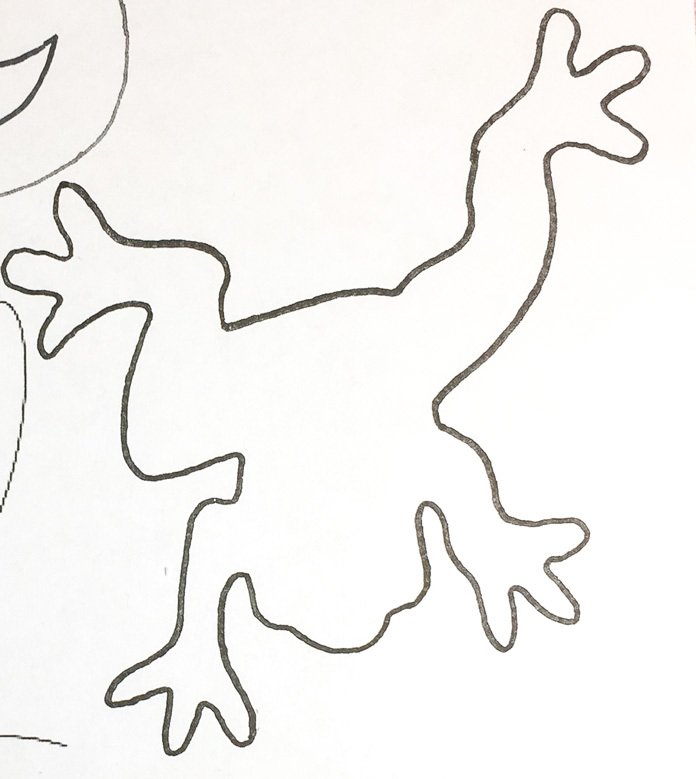 Cut your design out accurately now using the drawing on the paper side of the HeatnBond Feather Lite and tear away the paper backing. The wrong side of the applique will be shiny with a layer of glue. Center the applique design onto the bib front (right side of applique facing up) and when satisfied with placement, place a piece of Pressing Paper on top of the bib (shiny side down), press and hold for about 10 seconds. Check to see if applique is glued to bib front, if not press again. Applique the design any way you like! 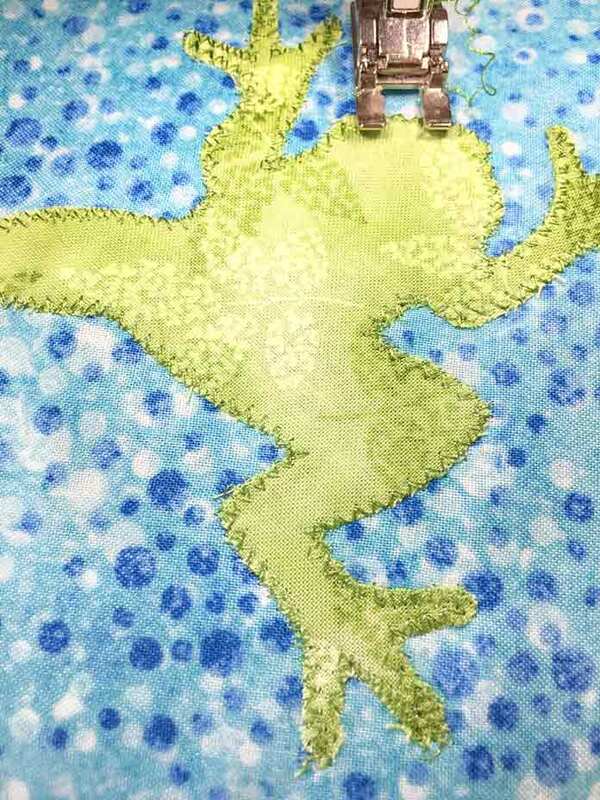 I used a small zigzag stitch and went over it twice to make it look natural just like a frog in the pond. 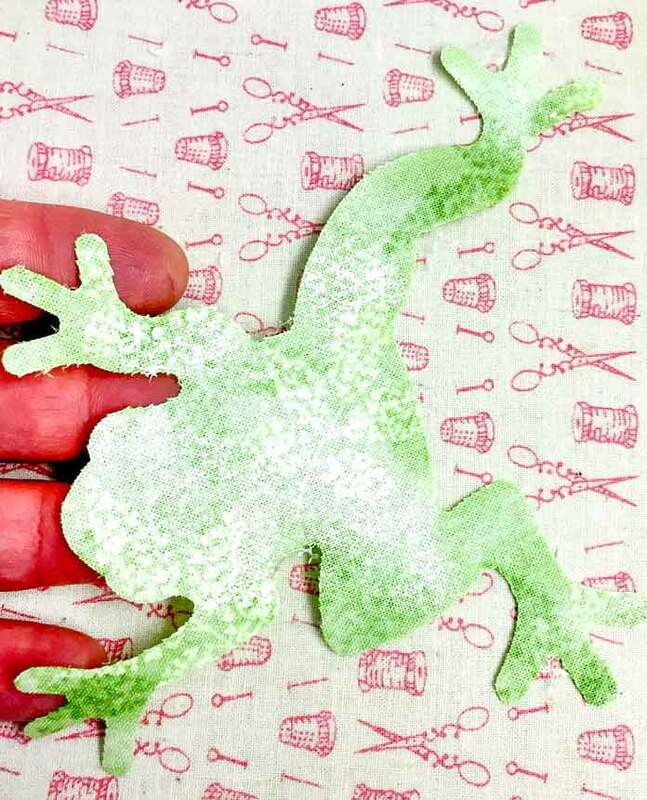 Frog edges stitched with a zigzag (2x) by machine, background fabric is from Northcott Stonehenge Kids Undersea 3D. Pin the front of bib and back of bib right sides together leaving about a 2” gap on the side for turning. Pin the backing to the front leaving a 2″ gap ready for sewing. Stitch with a ¼” seam allowance all around the bib, engage needle down at narrow neck back and go slow to be accurate and pivot around. Leave a 2” gap. Remove pins and trim seam allowance to ⅛”, clip corners and curves and turn to the right side through the gap. 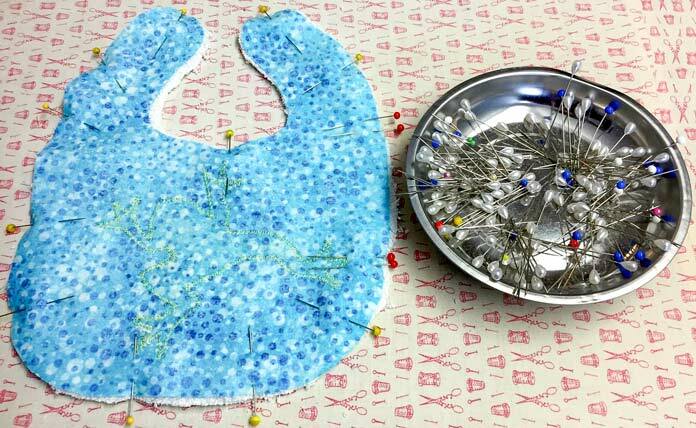 Press the bib, close in the gap with hand stitches and top stitch ¼” all around the edge of your bib. Add Velcro or a snap closure and admire your efforts. Your little people and parents/grandparents will love it! Come on back tomorrow when I discuss how to use HeatnBond EZ Print Lite. I’ll show you how to use your printer to draw out fusible applique designs for you. More design options equals so much fun!